Some useful links and documents provided for your private use only. Quelques liens utiles et documents proposés pour votre seul usage privé. Edward Pickering, "Stellar Magnitudes; A Request to Astronomers", Monthly Notices of the Royal Astronomical Society, Vol. 39, 1879, p391. Henry Dreyer, "A New General Catalogue of Nebulae and Clusters of Stars, being the Catalogue of the late Sir John F.W. Herschel, Bart., revised, corrected, and enlarged", Memoirs of the Royal Astronomical Society, Vol. XLIX, 1888, pp1-237 (Introduction). Henry N. Russell, "Giant" and "Dwarf" stars, The Observatory, Vol. 36, June 13, 1913, pp324-329. Henry N. Russell (1914), "The Spectrum-Luminosity Diagram", in "Source Book in Astronomy 1900-1950", Ed. : H. Sharpley, Harvard University Press, Cambridge, Mass., 1960, pp253-262. Joseph Fraunhofer (1898), "Discovery and Description of Lines in the Solar Spectrum", in "A Source Book in Astronomy", Eds: H. Sharpley y H.E. Howarth, McGraw-Hill Book Company, Inc., 1929, pp196-201. Gustav R. Kirchhoff (1861), "The Absorption Spectrum of the Sun", in "A Source Book in Astronomy", Eds: H. Sharpley y H.E. Howarth, McGraw-Hill Book Company, Inc., 1929, pp279-282. V.M. Slipher, "Planet X - Lowell Observatory Observation Circular", JRASC, Vol.24, p.282, 12 April 1930. First ephemeris of Pluto. Edwin Salpeter, "The Luminosity Function and Stellar Evolution", Astrophysical Journal, Vol. 121, 1955, p161-167. K.Margaret Burbidge, G.R.Burbidge, William A. Fowler, and Fred Hoyle,"Synthesis of the elements in stars", Review of Modern Physics, Vol. 29, issue 4, October 1957, pp547-650. (aka "B2FH"). Original magazine also available. Giuseppe Cocconi and Philip Morrison, "Searching for Interstellar Communications", Nature, Vol. 190, September 19, 1959, p844-846. Arno A. Penzias and Robert W. Wilson, "Measurement of Excess Antenna Temperature at 4080 Mc/s", Astrophysical Journal, Vol. 142, 1965, pp419-421. Andrei D. Linde, "Is the Lee constant a cosmological constant? ", JETP Letters, Vol.19, No.5, 1974, p183-184 (effects of scalar fields on the reheating in the universe, inflationary model). Alexey Starobinsky (Aleksei Starobinskii), "Spectrum of relict gravitational radiation and the early state of the universe", JETP Letters, 30, 1979, p682-685 (about the inflationary universe). Modified Zurich classification of sunspots. LTP events recorded from 1500 to 1967, in html format. Lunar Transient Phenomena Catalog Extension, W.Cameron, 2006. "Expanding Confusion: Common Misconceptions of Cosmological Horizons and the Superluminal Expansion of the Universe", SCIRO, 2004. "The Formation and Evolution of the Milky Way", Cristina Chiappini, Obs. Astr. di Trieste, 2001. Also available on G.Djorgovski website. Halton Arp's Atlas of peculiar galaxies. Scanned document extracted from NASA Extragalactic Database (NED). EVOLSTAR, petite évolution stellaire illustrée par Benjamin Mauclaire. Cet amateur décrit l'évolution stellaire en quelque 40 pages. Ce document explique d'une autre manière ce qui a été dit dans mes dossiers éducatifs consacrés à la diversité des étoiles et l'astrophysique solaire. Bright Star Catalog extracted from VizieR database up to magnitude 6 (~5000 stars). Display main references (ID) and parameters including equatorial coordinates in decimal format. File in CSV format. Catalogue des étoiles brillantes extrait de la base de données VizieR jusqu'à la magnitude 6 (~5000 étoiles). Présente les principales références (ID) et paramètres y compris les coordonnées équatoriales en format décimal. Fichier en format CSV. NEO, Table listing the closest encounter distance with NEO below 0.05 A.U. from Earth between 2000 and 2179. Table listant les rencontres rapprochées des NEO à moins de 0.05 U.A. de la Terre entre 2000 et 2179. Update on CNEOS. NGC-IC2000 catalog revised, the Complete New General Catalogue of Nebulae and Star Clusters published by John L.Dreyer in 1888, completed with the galaxy class according to Hubble classification and galaxy size (axb). Includes also all IC objects, based on documents from NGC/IC project. Autoextractible compressed file in Excel format. "Apollo eBook for PC", also available for Mac. A creation of Carlos Clariván. A document titled "A Journey to Inspire, Innovate, and Discover", June 2004. Differential Spacecraft Charging on the Geostationnary Operational Environmental Satellites (anomalies on geostationnay satellites caused by the solar activity), Winfield H.Farthing, James P.Brown, William C.Bryant, Tehnical Memorandum ref. 83908, NASA/GSFC, 1982. Optical characteristics of artificial satellites, SD 70-55, 1 july 1970, North American Rockwell. Surveyor 1 Program Results, 1969, SP-184, NASA. Arthur C.Clarke, "Extra-Terrestrial Relays - Can Rocket Stations Give World-wide Radio Coverage? ", Wireless Book, 1945. Clarke discusses about the idea to place a satellite on a geostationnary orbit (the famous Clarke Orbit), and mentions the concept of space station. Autoextractible file including 4 GIF pages. 1st realistic model of electron flow in a semi-conductor. 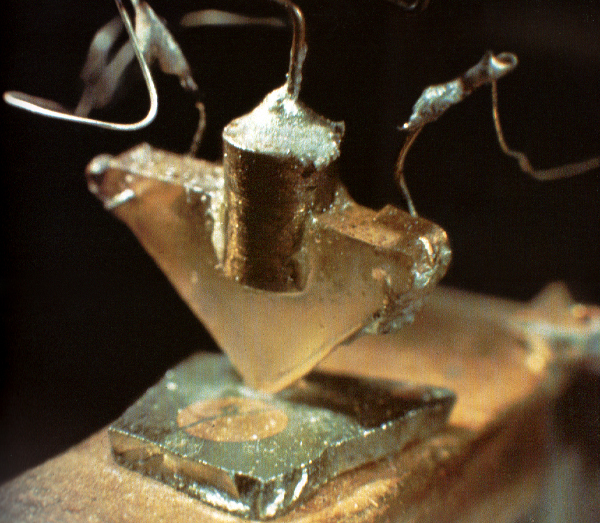 John Bardeen, Walter Brattain, and William Shockley (Bells Labs), "Three-electrode circuit element utilizing semiconductive materials", June 17, 1948. 1st patent of the contact-point transistor, patent #2524035. Characteristics of the 1st contact-point transistor. Gordon E. Moore, "Cramming more components onto integrated circuits" (Moore's Law), Electronics, 38, 8, 19 Apr 1965. Première référence à la "loi de Moore". Compilation of Local Fallout Data From Test Detonations 1945-1962 prepared for the US Defense Nuclear Agency. Extracted from DASA 1251, Volume I - Continental U.S. Tests, 1 mai 1979, General Electric Company. Extracted from DASA 1251, Volume II - Oceanic U.S. Tests, 1 mai 1979, General Electric Company. List of radio amateurs interested in astronomy. See the page "Hams in the Sky". Comparison of short tube (ST80 like) refractors - Comparaison des réfracteurs à tube court de type "ST80"
Histoire des climats et de l'atmosphère, ENS Lyon. Lire aussi L'espérance de vie d'une société. 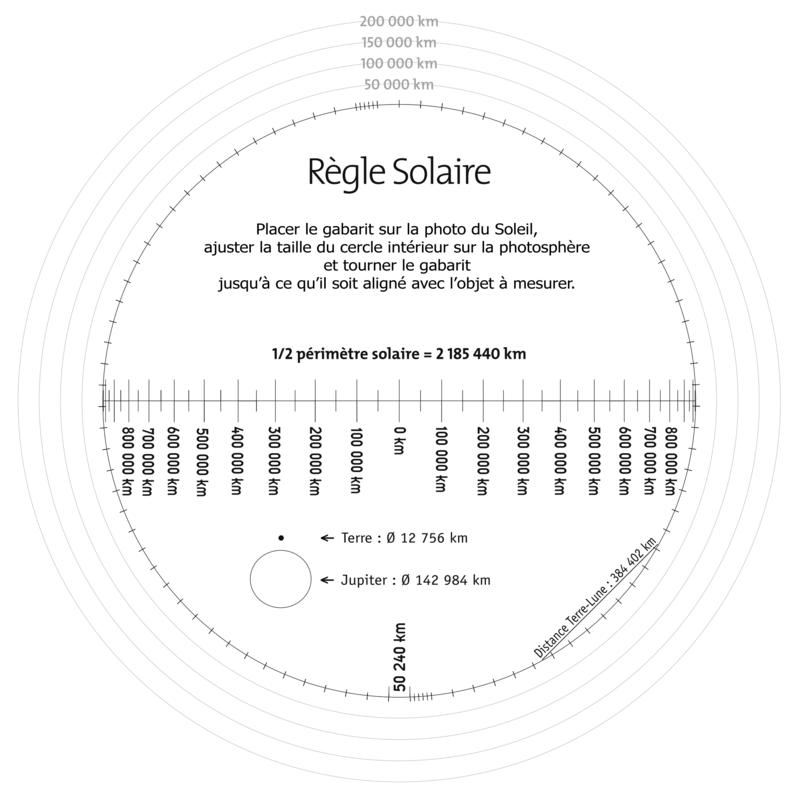 Règle solaire (image PNG dont le disque mesure 55 cm de diamètre, image de 2127 x 2127 pixels) à utiliser soit par projection-oculaire soit sur ordinateur sous forme de calque semi-transparent sur l'image numérique. Document préparé par Guy Buhry de Astroblue1. CCD Calculator (.exe) by Ron Wodaski, see also the new version 1.4 and version 1.5. NGic.exe - Fichier compressé autoextractible pour les utilisateurs de systèmes Goto. Un programme de Sylvain Riballet et Elisei Damien vous permettant de connaître la période de culmination d'un objet du ciel profond du catalogue Messier, NGC ou IC et d'être sûr de pouvoir l'observer. Consulter le site des auteurs pour les mises à jour éventuelles.